Hiring a car has become so much a part of a holiday for many of us that we often no longer even stop to think about it. It has become almost automatic – but it is clearly no more the only way to get around when we are away than it is when we are back at home. While we may be familiar with the benefit of bus or train in our daily commute, we should equally not forget their value on holiday – the general “green” credentials of public transport have been well enough established. All of the usual eco-friendly arguments apply, of course – even if not every country in the world boasts electric trains and bio-diesel buses – and in places where the need to conserve resources is particularly strong, public transport’s greater fuel efficiency wins every time. However, for the eco-conscious holiday traveller, there are also other considerations to take into account, which can make the social and economic case for public transport every bit as strong as the strictly environmental. Getting to your destination in the first place by public transport – and by train in particular – is already a viable alternative to flying in some cases, particularly if you live in the south-east of England and intend holidaying in the south of France. Travelling to Avignon from London, for instance, by Eurostar via Paris takes around six hours – not far off the time taken by air if you add in airport transfers and all the hanging around. With the recent arrival of Railteam and their promise of simplified travel within Europe, it seems that this will soon be a wider and even easier option. An alliance of nine high-speed train companies formed to compete directly with airlines, they will revolutionise ticketing arrangements, honour each other’s frequent traveller schemes and ultimately synchronise timetables, while guaranteeing the best possible fare for your journey. Congestion, pollution and parking problems plague all modern cities and the larger and more developed, on the whole, the worse the problem. The pressure is on the local population to use public transport every bit as much as it is for us where we live and work – the arguments are exactly the same. Fortunately, most cities are well served with suitable public transport networks, making using buses or trains simple to do. Though often less lavishly served, public transport is every bit as important away from the urban sprawl. 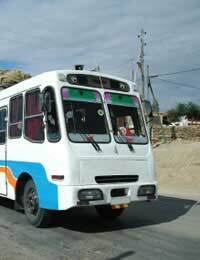 In many remote places, the local bus in particular remains an important social lifeline, guaranteeing that even the poorest can have the opportunity to travel should the need arise and in some cases, representing the only regular contact with the outside world. By choosing to use this way to get about, especially in rural areas where other forms of transport are either limited or non-existent, the eco-tourist is not only supporting the continuation of the service itself but also of the very community it serves. Discussing the importance of public transport in remote areas may conjure up images of rickety old buses rattling along pot-holed Vietnamese roads, stopping at every hamlet along the way, but the same principles also apply far nearer to home. You only have to look at parts of rural Britain to see the effect that reducing bus services has had. Home or away, when “everyone” drives cars, the losers are always the poor, the disadvantaged and the vulnerable. If your holiday is about experiencing the place you are visiting, then there are few ways better than by using a country’s public transport for meeting local people and getting a little insight into the nation’s psyche – as well as seeing more of the real place. A ride on a Bolivian bus – packed with locals and chickens in roughly equal proportions – is an experience you are unlikely ever to forget! Spend an hour or two like this and you will learn more about the real country – and more of the language – than on a week of “tourist” trips. In some parts of the world “public transport” can mean anything but buses and trains. A trip by rickshaw, ox-cart, camel, donkey or even the more familiar horse-drawn carriage is not only about as environmentally friendly as you can get – it can also add a whole new dimension to your experience. More importantly, not only are you supporting the local economy but also helping to keep alive something distinctly “different” – which is probably at least part of the reason you chose the destination in the first place. So, how important is using public transport on holiday? At least as important as anywhere else – and quite possibly a little more so!